Though a bicuspid aortic valve (BAV) usually causes no difficulties in childhood, it may lead to complications in the adult patient. Calcification of the valve leaflets can occur as the patient grows older (usually in the 5th-6th decade). This may lead to progressive narrowing (stenosis) and heart failure. 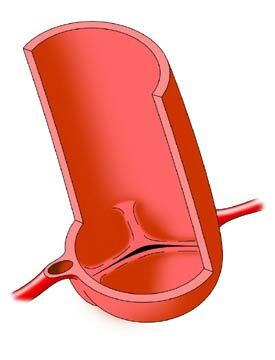 In rare cases, the ascending aorta becomes enlarged (dilated) and, with progressive dilation, there is the risk of dissection (splitting open) of the aorta. These complications can be anticipated by regular follow up. Because of these risks, it is important for the patient with BAV to be monitored regularly by a pediatric cardiologist.